It should have been a short suspended-animation sleep. But this time Rose wakes up to find her past is long gone– and her future full of peril. Rosalinda Fitzroy has been asleep for sixty-two years when she is woken by a kiss. Locked away in the chemically induced slumber of a stasis tube in a forgotten subbasement, sixteen-year-old Rose slept straight through the Dark Times that killed millions and utterly changed the world she knew. Now, her parents and her first love are long gone, and Rose–hailed upon her awakening as the long-lost heir to an interplanetary empire–is thrust alone into a future in which she is viewed as either a freak or a threat. Desperate to put the past behind her and adapt to her new world, Rose finds herself drawn to the boy who kissed her awake, hoping that he can help her to start fresh. But when a deadly danger jeopardizes her fragile new existence, Rose must face the ghosts of her past with open eyes–or be left without any future at all. Imagine the story of Sleeping Beauty set in the future with some Doctor Who-like elements. Now imagine that nobody woke the Sleeping Beauty up for sixty-two years, and you’ve got the core idea for A Long, Long Sleep. This SciFi book deals with what happened after Sleeping Beauty woke up; and it wasn’t exactly happily ever after for her. Rose is sixteen (technically) and her whole world has changed. She doesn’t understand the new slang or the futuristic inventions, an alien classmate thinks her mind is scary, she’s keeping her sad and mysterious past a secret, and everyone she ever loved is gone. To top it off, there’s a robot set out to “Terminate!” her. I really enjoyed the mystery this story presented. Piece by piece, we’re handed Rose’s back story, which shapes so much of who she is and why she acts the way she does. Her past also ties in with why she has to keep running and hiding from the robot who wants to kill her (but who programmed the robot?). I really enjoyed watching Rose’s character develop. She goes from having no backbone to facing down everything that stands in her way in the amazing and emotional final chapters. While it was easy for me to guess part of her back story, that didn’t stop it from still being utterly shocking and heart-breaking when the truth finally does come out near the end of this book. The few parts also told from the robot’s point of view were an interesting addition to the story (“But he had no feelings. All he had were updates.”) and I also enjoyed getting to see Rose interact with fellow outcast, Otto the alien. I love the realization that Rose has that, even though this is a type of SciFi Sleeping Beauty story, she’s not exactly the Sleeping Beauty. She’s not cursed, passive, and waiting for Prince Charming. Instead, she represents the rose hedge in the story, strong and impenetrable. Rose’s last statement that concludes the story is also very powerful and beautiful, both hopeful and sad, which I thought was a great ending. Okay, so there’s no musical sequence with forest critters in A Long, Long Sleep; I just needed to use a Sleeping Beauty retelling as an excuse to use a gif of my favorite scene in Disney’s Sleeping Beauty. At first, Rose didn’t come off as a strong character at all. She didn’t speak up when she clearly needed to and hardly had any confidence. However, we got to see why Rose acted the way she did, and better yet, overcome it. So, while Rose was kind of annoying in the beginning, it was gratifying to see her character grow and get to know her back story. The whole love story (in flashbacks) kind of seemed bizarre and awkward at first and took some getting used to. Actually, the whole first couple chapters of the book almost made me put it down, but I am so glad that I didn’t, because the author really gives you reasons and back stories, lets her characters grow, and has an amazing finale. I think both covers are beautiful; the roses on the hardcover version represent an interesting aspect of the story, but I also like the blue tones and the tiny swirls on the paperback. For me, the hardcover wins this contest as I think the roses are beautiful and it seems to fit the book’s genre more than the paperback. 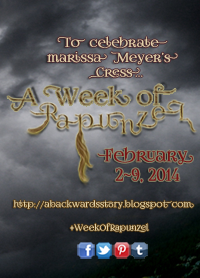 Remember to come back to Readerland for more Fairy Tale February posts! Ha that’s m favorite Sleeping beauty Sven too. I hadn’t heard of this, but usually enjoy retellin ha, so I’ll have to put it on my list! 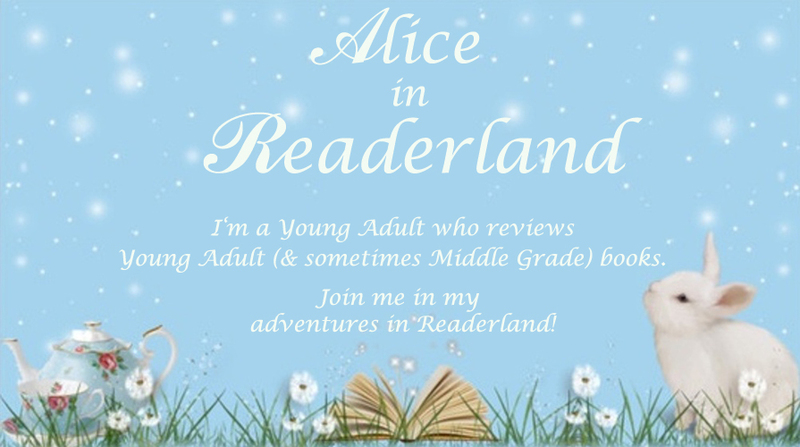 I just love that scene from Sleeping Beauty; I hope you enjoy the book when you read it! :) Thanks for stopping by & commenting! 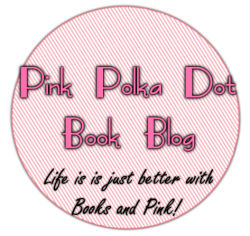 Oooh, thank you so, so much for introducing me to this book through your great review! I love retellings (of course) and ones that haven’t been done too many times to death like Sleeping Beauty really pique my interest. Then there’s the dystopian part and mystery in there that make me do a happy jig in my seat. This sounds fantastic! I love that Rose isn’t passive and even though at first she seems weak, she really bucks up. I’m really interested to read her concluding statement. Love the review!! I feel like this is too similar to The Lunar Chronicles…a fairy-tale adaptation set in a post-apocalyptic world with robots. The cover is gorgeous, though. That’s exactly what I thought, but as it ends up, this was published before Cinder. I love this cover! :) Thanks for stopping by & commenting! Really?? Wow ok that’s cool then. It’s too bad this one isn’t so popular, especially since Cinder is everywhere, and they have such similar concepts. I know, I think it’s really interesting how they have similar concepts, yet one is so much more popular than the other! You had me at Dr. Who + Sleeping beauty! Totally listing! I’m so glad to meet another fan of this book! I thought it was amazing and definitely deserves more attention. I loved how Rose grew. :) Thanks for stopping by & commenting! I’ve had this book on my Kindle for so long and now I’m kicking myself that I haven’t read it yet. Doctor Who elements????? I must read this ASAP! Great review! I really loved this book! I was probably thinking more on the ‘Doctor Who’ elements as I just started watching the show at the same time I was reading this book! :) Thanks for stopping by & commenting! Now I am curious! Was brought to this post by reading your Top 10 fave characters. I’ll hunt this down and read this! BTW love your blog! It’s pretty depressing how I’ve never heard of this before. I fell in love with the idea of ‘sci fic fairy tales’ and a sci fic version of sleeping beauty? Count me in.